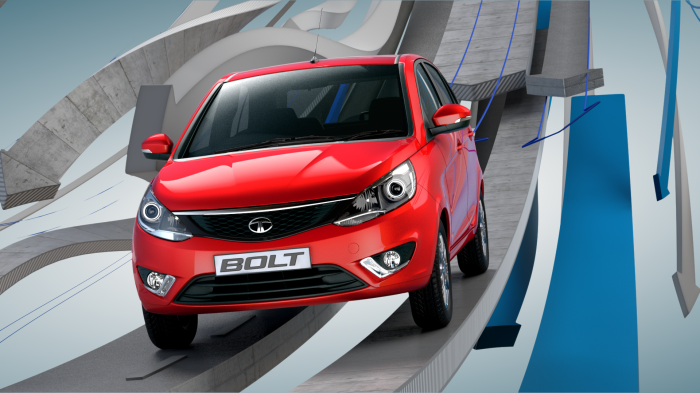 During the 2014 Indian Expo, Tata Motors unveiled the new hatchback Bolt. It will hit the roads in 2014. With its aggressive styling, well designed interiors and decent performance, it hopes to gives tough competition to existing hatchbacks like Volkswagen Polo. Polo debuted in India in 2010 and has been putting up respectable sales figures for the German carmaker. The company has also updated the Polo hatchback to make it more powerful. Tata Bolt features stretched projector type headlamps, LED tail lamps, integrated body coloured bumper with running daylight LED lamps and OVRMs with turn signals. It has bold character lines that enhance its side profile. Polo has a more understated design that is tamer in comparison. It sports indicator head lights that come integrated with chrome trimmed radiator grille with Volkswagen logo in the centre. The front bumper carries integrated fog lights. The sporty look of the vehicle is enhanced by the 7-sloke alloy wheels. Tata Bolt boasts of a spacious cabin with an upgraded dashboard. It features Harman stamped touch screen display with features like Bluetooth, speed sensing audio controls, voice recognition etc. Polo has a plusher looking cabin than Bolt and also has more comfortable interiors. The new flat base three-spoke steering wheel is the highlight of Polo’s interiors. The voice command and chrome accents are other notable features. Volkswagen Polo can be had in three engine options. Its 1.2-litre 16V TSI petrol mill produces 103.6bhp of power and torque of 153Nm. The other petrol engine is the 1.2-litre 12V in-line petrol power train that develops power of 73.9bhp and torque of 110Nm. The diesel engine is the 1.5-litre 16V, 1197cc TDI diesel mill that delivers a maximum power output of 105bhp and a peak torque of 250Nm. Tata Bolt sports the 1200cc, 1.2-litre Revotron Petrol engine that churns out 84bhp of power and 140Nm of torque. The diesel model of the car is powered by 1300cc, 1.3-litre Quadrajet engine delivering 89bhp of maximum power and 190Nm of peak torque. Bolt comes with EBD, ABS, EPS, dual airbags and side intrusion beams. Polo too has decent safety features but it lacks EBD. The ARAI certified fuel economy of petrol and diesel models of Polo is 17kmpl and around 20kmpl respectively. Bolt does a little better on the mileage front. The petrol powered Bolt delivers 18kmpl of mileage while the diesel version offers 23kmpl of fuel economy. Polo is priced in the range of Rs. 4.99lakh to Rs. 8.81lakh as is more expensive than Polo that falls in the price range of Rs. 4.4lakh to Rs. 6.5lakh. Polo comes at a slightly higher price and its maintenance cost is higher than Tata Bolt. But it scores in interiors department and on the performance front. Bolt comes across as a better bargain with higher fuel efficiency along with excellent safety and comfort features combined with a lower price tag.